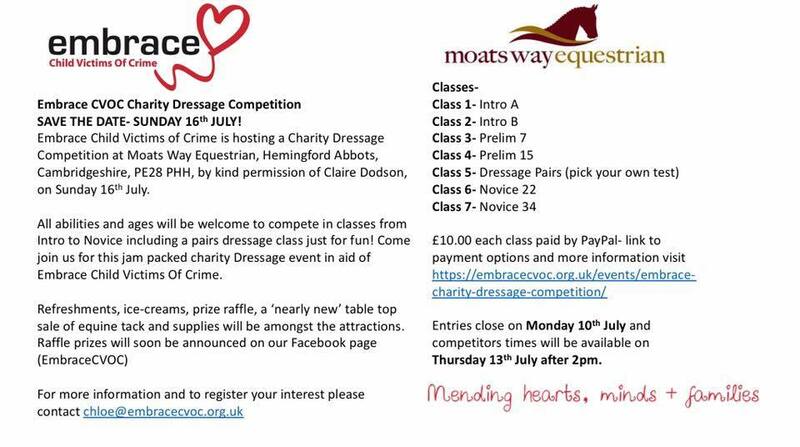 Embrace Child Victims of Crime is hosting a Charity Dressage Competition at Moats Way Equestrian, Hemingford Abbots, Cambridgeshire, PE28 PHH, by kind permission of Claire Dodson, on Sunday 16th July. All abilities and ages will be welcome to compete in classes from Intro to Novice including a pairs dressage class just for fun! Come join us for this jam packed charity Dressage event in aid of Embrace Child Victims Of Crime. Entries close Monday 10th July. Times published Thursday 13th July after 2pm. Ice creams and refreshments, ‘Nearly new’ equine table top sale, Embrace stand, Prizes raffle- prizes to be announced on social media leading up to the event. For further information email claire@moatswayequestrian.co.uk.